Hammond Vintage 105 & Brand New Leslie 122A Sold! The Hammond Vintage B3, C3, A-100, A-105 & Rt-3 are all the same organs. The only different is cabinet styling. They play, sound and all feel the same. The A-100 & A-105 have a nice grilled cloth and internal speaker system as well as the external Leslie Speaker, giving these organ lots of power. This Hammond A-105 is gorgeous. 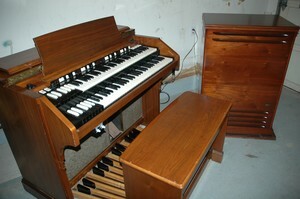 It's a killer organ, especially for a church seeking a vintage Hammond organ for their music ministry. The cabinet is the exact same cabinet as the C3. It also has internal speakers as well as a brand new 122A external Leslie speaker, again, with lots of power, making this a nice package. This will also include a brand new Leslie switch and full warranty. If you’re sincerely in the market for an awesome sounding vintage, that is also affordable, here it is. Don't wait, this will be sold soon. For more information, call Vince Seneri personally at 973-377-2251. Financing available for churches and consumers.